Growing winter vegetables is different from the warmer months of the year because you have different amounts of sunlight, cold winds, and in some districts, frost to contend with. Then there's controlling plant diseases in your veggie patch? How well do you know your plant families? Did you know that you shouldn’t plant veggies from the same plant family in the same spot year after year? That’s all part of crop rotation which means of course you need to know your plant families. 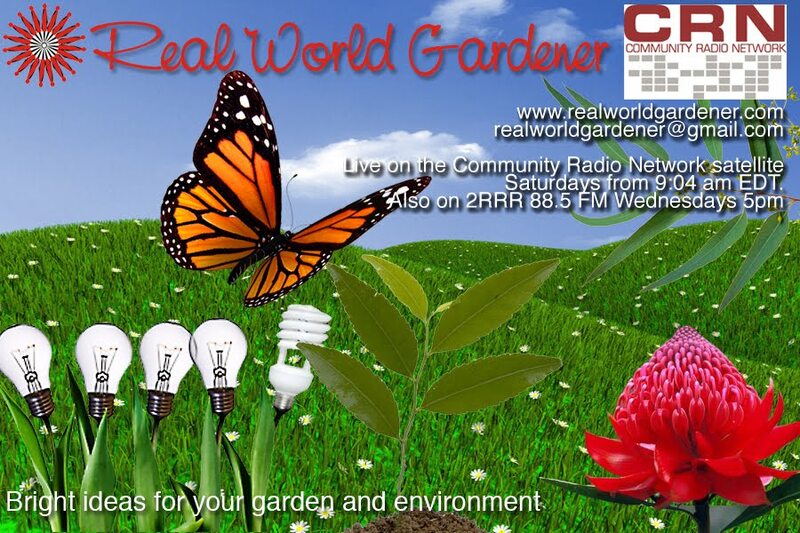 There’s good reasons for practising crop rotation, but what if you only have enough room for a couple of veggie garden beds, what does a gardener do? That was Margaret Mossakowska, director of www.mosshouse.com.au and Permaculture North Course coordinator. Soon you’ll be saying things like Brassicas, Solanacea, and Fabaceae with ease and know what veggies belong to these families. Brassicas are all the cabbages, broccoli, kohlrabi, brussel sprouts and cauliflowers. Solonaceae are the tomates, capsicums, peppers, chillies and potatoes. 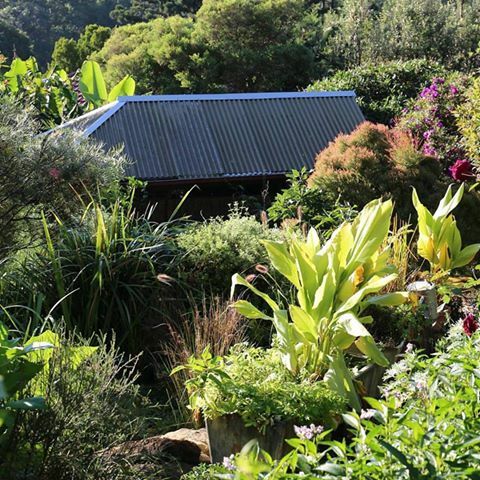 Margaret’s tip to fertilise your garden is to use your homemade compost or if you don't have any than add fertilisers like pelletised chicken manure or chook poo. This is important for members of the Brassica family because the grow a lot of greenery. I’ll be posting an image of the crop rotation diagram that Margaret mentioned at the beginning of the segment on my website blog post page. If you have any questions about winter veggie gardening or have some information to share, drop us . Although kohlrabi (Brassica oleracea gongyloides or B. Oleraceae variety caulo-rapa) and brussels sprouts (B. oleracea variety gemmiferalook like they belong in two different families, they are in the Brassicacea family, along with cabbage, kale, broccoli, and cauliflower . Would you believe that all these vegetables came from a common parent, "wild cabbage"? You don’t see a lot of Kohlrabi today but it’s been around awhile was known to the Roman Empire. Did you know that by the year 800 A.D., the Holy Roman Emperor Charlemagne ordered that kohlrabi be grown in his Imperial gardens. Although Charlemagne is thought to be French, he was actually from western Germany. "Kohlrabi" is a German word where Kohl means cabbage and Rabi means turnip. "Kohlrabi" Means "Cabbage Turnip"
By the end of the 16th century it was known in Germany, England, Italy, Spain, Tripoli, and the eastern Mediterranean. Kohlrabi is another one of those vegetables that has the person at the supermarket checkout stumped, you’ll be asked what it is. If you get a mental blank at that point, be prepared for a flurry of activity as someone else is called to the checkout to inspect what you’ve got and identify it. Kohlrabi for sure has fallen off the flavour of the month vegetable chart. In fact, you probably won’t be able to find the seeds at a lot of garden centres. The funny thing about Kohlrabi is that even though it looks like a root vegetable, it actually isn’t. The bit that you eat grows above ground. So far I’ve only seen the purple variety in shops, and when I used to work for a large well known seed company, the seeds were available but have since been taken off due to lack of interest. Kohlrabi is a good choice for beginner gardeners because it’s fast and easy to grow of all the Brassicaceae family. 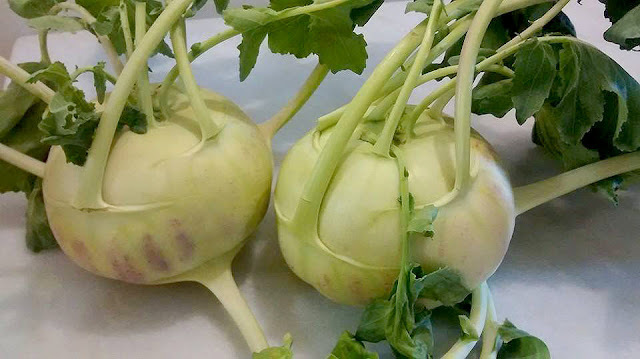 Your kids will love kohlrabi because of it’s funny appearance. Sort of like little aliens from other space-a little round body with little "legs" coming out of the ground. If you’re into companion planting, Kohlrabi grows well with Beetroot because they have the same water requirements. You can also fit Kohlrabi in between lettuce, onion and radicchio, because it sits above the ground and doesn’t take up as much room as cabbages . You can direct seed Kohlrabi or start them in punnets or seed trays because they don’t mind being transplanted. In temperate districts deep January to May and again from August until December so almost all year. For arid zones, February to June is the best time. March to August for sub-tropical and April to August for tropical zones. Sow the seeds about 1 cm deep in rows 30 cm apart and thin them out to 15 cm or a couple of hand-widths apart. Or like me, just put them wherever you’ve got space in your veggie bed. Kohlrabi can be rather closely spaced (or interplanted) and is out of the garden in 60 days (2 ½ months)or so, leaving time to plant something else. As with all vegetables a standard application of an organic fertilizer, mixed into the soil according to label rates prior to planting, is all you need to do. So when do you pick your Kohlrabi? If you want small kohlrabi, pick them when they’re about 6cm in diameter, with the leafy greens still attached. The greens should be deep green all over with no yellowing. Although kohlrabi stores well, up to one month refrigerated, yellow leaves means that the vegetable is not fresh. Now you may be wondering how to eat Kohlrabi, and it wouldn’t be fair if RWG didn’t pass on that information. Kolhrabi sort of tastes like the stem of Broccoli or heart of a cabbage but sweeter. Remove the stems by pulling or cutting them off the kohlrabi globe. If the kohlrabi is small, there is no need to peel it, but you might want to cut off the tough base end. If you've bought large kohlrabi, peel it and slice off the tough woody base before slicing or dicing. Slice or cut into julienne and include it on a relish tray with dips. Coarsely grate kohlrabi into a tossed salad. Because it is mild, succulent and porous, it absorbs the flavour of a mild or pungent salad dressing quite well. Dice kohlrabi and combine with your favourite vegetables and dressing for a chopped salad with delightful crispness. Slice kohlrabi, put it in a container, and pack in your bag for lunch for a crunchy snack. Chop and include as one of the ingredients in a raw soup. Slice kohlrabi or cut into bite-sized pieces and put into a saucepan with 1cm of water. Add a dash of salt, cover and bring to a boil over high heat. Turn heat down to low and steam for 5 to 7 minutes. Leaves can be steamed lightly just as you would do spinach. STIR FRIED Dice or chop into bite-size pieces and stir fry 5 to 7 minutes in a little extra virgin olive oil with a clove or two of minced garlic and a dash of salt. Kohlrabi is very low in saturated fat and cholesterol. It’s rich in thiamine, folate, magnesium and phosphorus and is packed with dietary fibre, vitamin C, vitamin B6, potassium, copper and manganese. The only bad thing about kohlrabi is that a large portion of the calories in this food come from sugars. 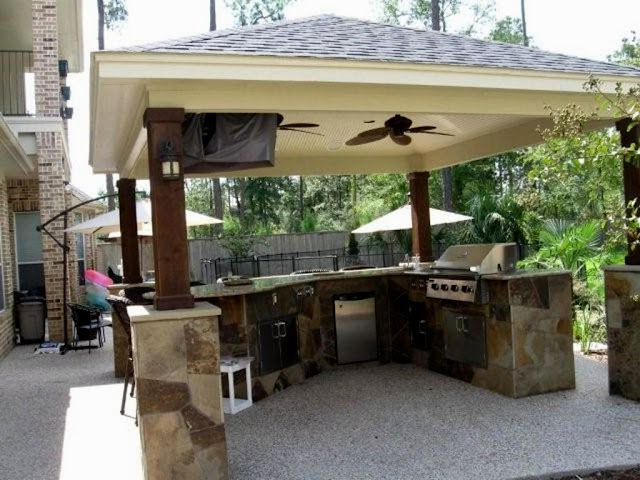 Whatever you think an outdoor room is, it’s probably not going to have all the bells and whistles of the kitchen you have in your house. But, say your outdoor eating space is best at the back of the yard or down a flight of stairs, what do you do then? Australia is too sunny to always be eating indoors so you might think about doing a bit more than the good ole’ BBQ. That was Matt Leacy Principal Landscape Designer and Director of Landart Landscapes. 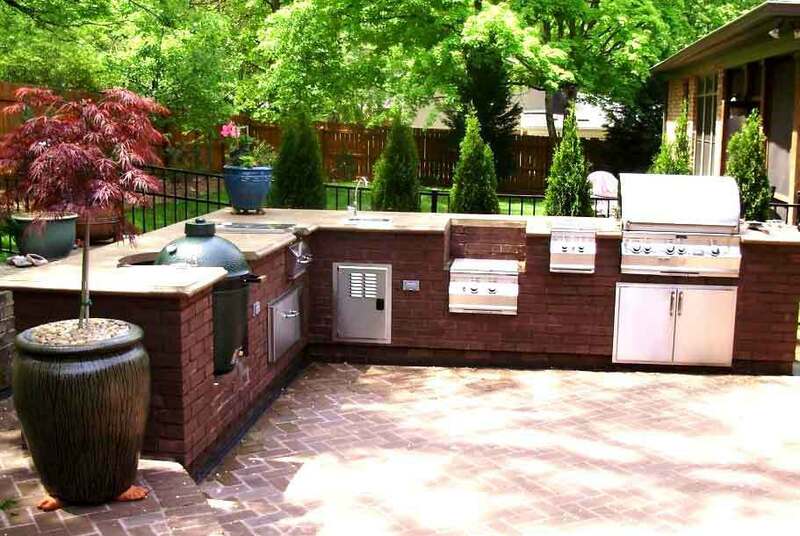 You may not want to go the whole hogg of fridge, dishwasher and fancy BBQ in your outdoor room, but I think the Pizza oven sounds like a great idea. Soon you’ll be making your own pizza dough, and buying a pizza peel, that’s one of those wooden or metal spatula type implements that puts your pizza into the pizza oven. Whatever you do in your outdoor room, don’t forget the garden. An outdoor room without a garden is just to droll to contemplate. 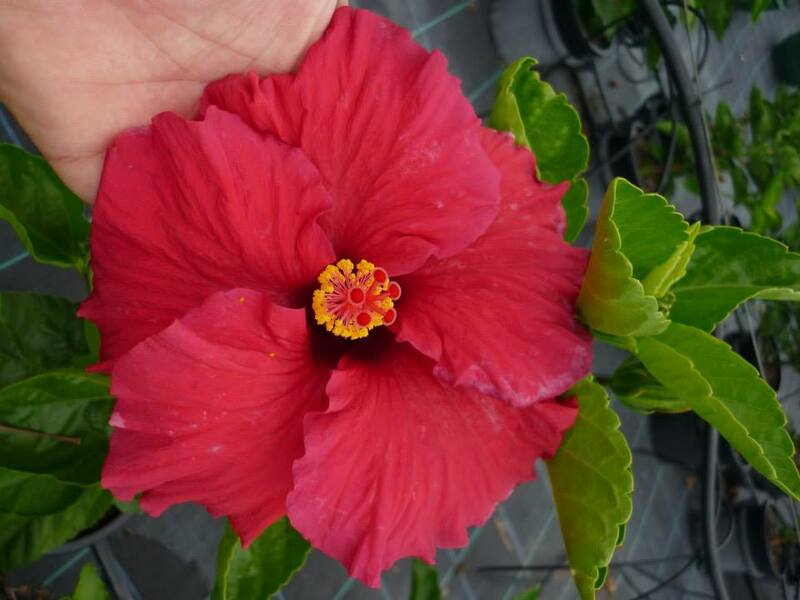 The flower on this week’s plant of the week is often associated with Hawaii and other tropical places but did you know that it originates in China? We tend not to think of China as being a tropical place but I would imagine, some districts would have a tropical feel to them, perhaps up north near the coast. And not all tropical plants are frost tender, so. 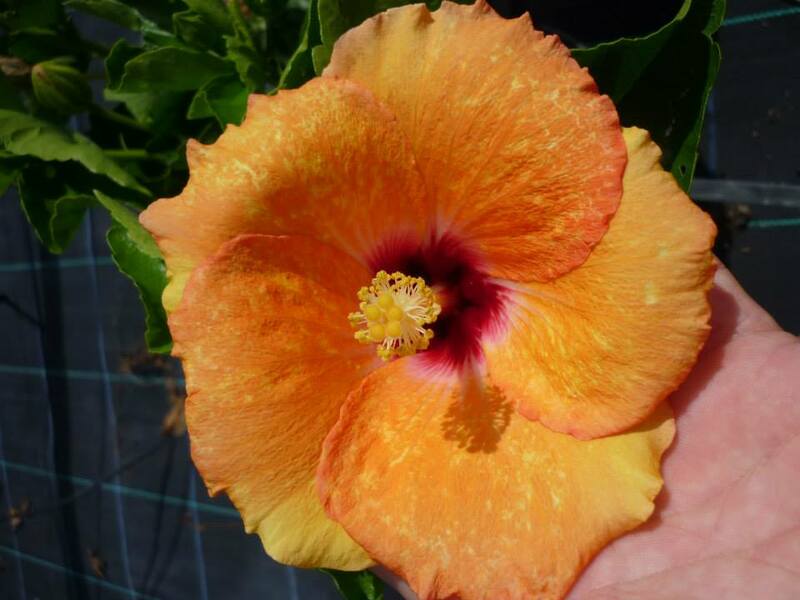 Hibiscus Tradewinds-Jeremy holding the flower. Consider the Hibiscus Tradewinds if you want large decorative flowers and a tropical feel to your garden even if you live in a frosty climate. As Jeremy said, they Tradewinds can be grown in a pot so you can move it under cover when winter or frosty weather arrives.